On March 1, 2018, doctors performed brain surgery on the wrong patient at Kenyatta National Hospital (KNH), the oldest and largest referral hospital in Kenya, a public tertiary care facility operated by the Kenya Ministry of Health, and the teaching hospital of University of Nairobi College of Health Science. The ordeal began four days earlier when two unconscious men were transported to KNH. One required surgery to remove a blot clot from his brain, and the other had a closed head injury that required nursing care and medication. However, due to an identification tag mix-up, the wrong man underwent brain surgery, which was not discovered until two hours into surgery when the surgeon discovered no blood clot. The event raised many questions, including whether Kenyan hospitals have instituted adequate pre-surgical procedures. Patients wear name tags on their hospital gowns, but it is the only method of identification. In addition, the CT scan the surgeon received was from the wrong patient . Although similarly serious “wrong-site” incidents occur in hospitals throughout the world, the Kenyan incident was reported in newspapers and other media not only in Kenya  but also internationally in India, Singapore, Israel, United Kingdom, United States and more     . Such international, negative attention does not normally occur for wrong-site incidents in the United States, which are equally serious and devastating  . Examples of US incidents include surgeons at Rhode Island Hospital operating on the wrong side of patients’ brains three separate times in 2007 , and 315 wrong-site incidents reported by Florida medical facilities to the Agency for Healthcare Administration during a 4-year period between 2012 and 2016 . The latter includes placing a mechanical implant in the wrong heart valve of an 11-year-old Orlando, Fla., boy who subsequently died, removing a portion of a 19-month-old’s right testicle when he had been admitted for hernia surgery, placing a chest tube in the wrong patient, and amputating the wrong leg . Although wrong-site surgery is estimated to occur 40 times per week in hospitals and clinics in the United States , the Kenyan event received significantly more media exposure. Why? Maybe it is because of the health care disparities Kenya faces. HeSMA’s mission is to build the capacity of its members and to raise the quality of health management in Kenya and the greater region of Eastern Africa. It brings together research, health practice, policy and management communities with members from hospitals, universities, ministries of health, primary care providers, management professionals, consultancies and more. HeSMA, Kenya’s only professional membership organization for healthcare managers, is open to all organizations or individuals committed to improving health in Kenya and the surrounding region by raising the standards of health management. As such, it is becoming an instrumental force in professionalizing the country’s health care delivery, especially since launching its 6-year educational partnership in 2015 with Oklahoma’s Northeastern State University (NSU). The partnership provides a full range of online health management and leadership training programs to healthcare executives and managers in Kenya through NSU’s College of Extended Learning’s Blackboard Learn e-learning technology. Courses provide CPD (Continuing Professional Development) awards through Kenyan regulatory bodies and contribute to progression from regular membership to Diplomate and Fellowship with HeSMA. The HeSMA-NSU course schedule for international online learners includes a Healthcare Administration Certificate Program (3.2 CEUs for each course) plus double streaming and separate international courses in: Population Health Management, Leadership for 21st Century Healthcare Executives, Physician Practice Development and Operations, Quality Processes, Accountable Care Initiatives, Governance and Trustee Effectiveness, and Health Services Management/Case Studies (under development). Kenya needs 4,500 trained healthcare managers for management and leadership roles. A reported 52 percent of managers in current leadership positions do not have the minimum required professional qualifications. However, based on surveys done since 2008, the landscape is changing with more healthcare professionals (doctors, nurses, clinical officers and others) pursuing professional development and credentialing in specialized management courses. As is the case for all nations around the world, demand for health care is increasing dramatically. Medicine is rapidly switching focus from disease treatment to disease prevention, which requires increasing numbers of health systems operators and specialists. The government of Kenya has led professionalizing health care by accrediting more academic programs, which has contributed to the country’s rapid growth in healthcare delivery during the last 10 years. In response to these rapid changes, HeSMA’s professional development framework cuts across training, recruitment and promotion/retention, and general practice and governance of healthcare management. In 2018, the culmination of three years of planning resulted in the availability of HeSMA board certification for Kenyan healthcare leaders who meet stringent qualifications criteria. To date, the distinguished title of Diplomate and Fellow of Health Systems Management (DHSM and FHSM) have been conferred on 10 Kenyans: Dr. Omar Ahmed Omar, Ministry of Health; Dr. Florence Maswan Jebichi, Kenya Medical Training College; Dr. Lyndon Marani; Dr. Nancy Mucogo Njeru, Ministry of Health; Rachel Waireri-Onyango, GE Healthcare; Fredrick Kimemia, HeSMA; Johannes Obambo Odhiambo, Adcock Ingram; Mary Wambui Makumi, HeSMA; Lynette Otwori, Kenya School of Government; and Dr. John Masasabi, Kenya Medical Training College. This professional certification has been patented for healthcare managers, executives and physicians working in Kenya. Use of DHSM and FHSM certification titles can only be displayed by individuals who have gone through the rigorous credentialing process involving submission of signed training documents and accomplishments carefully reviewed by the HeSMA Certification Review Committee of the board. Board Certification is based on a point system relating to: (1) the candidate’s academic and professional qualifications, (2) management and leadership experience, (3) life-long learning achievements in board approved course-work, (4) community and volunteer activities, (5) mentorship responsibilities, (6) peer-reviewed publications, and (7) letters of recommendations from distinguished professionals in the healthcare field. 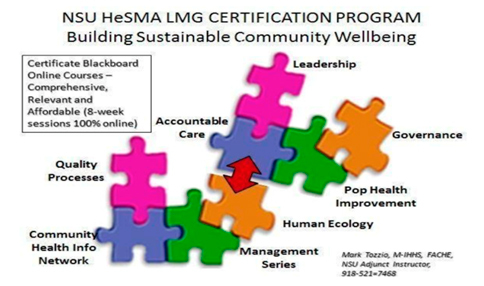 Kimemia explains that this Board Certification process has been a longstanding goal of the Kenya Ministry of Health to develop a national healthcare system led by ethical professionals trained in leadership, management and governance (LMG). The HeSMA board has adopted priorities for 2018 based on member communication and professional goals, which include developing further the membership enrichment programs and networking opportunities, and engaging more healthcare leaders on their journey to excellence. In response to these mandates, HeSMA – in its partnership with NSU’s College of Extended Learning – also launched a specialized LMG Certificate Program for Kenya’s health professionals in urban and rural regions of African nations. The HeSMA-NSU Health Care Administration Program Certificate won the 2018 Outstanding Services to Underserved Populations Award from the Association for Continuing Higher Education. Kimemia explains that HeSMA board and staff have worked closely with the Kenya Health Regulatory bodies, including Ministry of Health, to strengthen leadership skills of current and future healthcare executives and middle managers throughout the nation. These programs will help HeSMA and Kenya deliver on their goal of creating a pool of health executives/manager in the region that meets international standards. The NSU CE (Continuing Education) program Healthcare Administration for Physicians and Managers is currently attended by professionals from Kenya, Somaliland, Nigeria, Cayman Islands and Aruba. This opportunity to interface with international peers on problem solving and networking is invaluable, especially to groups of people who traditionally have been outside the mainstream of US and international healthcare education and professional practice standards. All health care organizations need skilled professionals to operate them. Hospitals, nursing homes, doctor’s offices, clinics and other health care facilities and projects/programs are no exception. A person receiving a bachelor’s or master’s degree in healthcare management is qualified to work in the management of any of these facilities. The levels could be middle, senior or executive. A competent health care manager ensures hospitals and healthcare organizations run smoothly. They track trends and implement changes to improve patient care and organization efficiency. Healthcare managers supervise employees, such as doctors and nurses, and ensure adequate staffing, especially those trained in key areas of management and clinical quality. They oversee hospital budgets and ensure adequate revenue to cover improvements like the latest technology. Health care managers have a diverse range of responsibilities and make a meaningful contribution to their facilities and their communities. Earning a bachelor’s or master’s degree in healthcare management requires a variety of courses, such as strategy, organizational development, leadership, management, communications, marketing, finance and budgeting. Health care in general faces many business-related challenges and, hence, orienting healthcare managers in these areas is paramount. In Kenya, five universities and two colleges have been accredited to provide health management-related academic programs. They include Kenya Methodist, Moi, Nairobi, Kenyatta, Strathmore Universities, Kenya Medical Training College and Kenya School of Government. Programs and degrees include Health Systems Management, Health Care Management (Masters), Public Health-Strategic Management (Masters and PhD), and Health Services Management (Bachelors and Masters). Diploma and certificate programs are also available, which give junior- and middle-level managers skills to manage and lead. Specialized courses are mandatory for operating professional and regulatory frameworks in Kenya. Effective leadership turns possibilities into realities. The challenges and uncertainties that occur in the health sector today are creating opportunities that go far beyond rethinking how to organize systems and pay-for-care. Healthcare management and leadership professionals are vital to Kenya’s health care future since the country must run efficient and effective health care organizations that keep patients healthy while tackling emerging health conditions. This can only be done by keeping current with changes in healthcare provision and regulation. This will ensure their organizations are offering the most efficient and effective health care possible while remaining in compliance with ever-changing laws and regulations within different professions. Patients – as healthcare consumers – demand high quality, affordable health care. It is up to managers to meet the challenge by listening and working to understand internal and external needs and resources. In addition, they have to identify problems in their facility or project and present solutions that are measurable, then implement those solutions and measure their success (results-based management). Attainment of HeSMA’s Board Certification is a testimony of an individual’s dedication to excellent healthcare management. With this and other professional development tools and education, Kenya and other East African nations can achieve significant gains in best practice outcomes, competency and compliance with international healthcare standards. Health Systems Management Association (HeSMA) is a not-for-profit professional membership organization that aims to build the capacity of its members and raise the quality of health management in Kenya and the greater region of Eastern Africa. HeSMA brings together research, health practice, policy and management communities. Its membership is comprised of hospitals, universities, ministries of health, primary care providers, management education schools and consultancies. HeSMA membership is open to all organizations or individuals committed to improving health in Kenya and the surrounding region by raising standards of health management. It is funded through membership fees, project income, sponsorships and other non-profit making programs. HeSMA is registered with the AG office under the society’s act of 1968 under Kenyan law and domesticated within countries of larger Eastern Africa. For more information, please contact Fredrick Kimemia, FeHSM, MSc, at kimemiafred@hesma.or.ke. Northeastern State University (NSU) has been in existence in one form or another since 1909. The current name was authorized in 1985, and NSU is currently a non-profit, regional, state-supported university. It is Oklahoma’s fourth-largest, public, four-year institution and one of six regional institutions governed by the Regional University System of the Oklahoma board. The university serves as a learning hub in northeastern Oklahoma formed by three campuses – the main campus in Tahlequah and branch campuses in Muskogee and Broken Arrow. For more information, please go to www.nsuok.edu. Daily Nation; Horror at KNH as Doctors Open Skull of Wrong Patient, Mar. 1, 2018; https://www.nation.co.ke/news/KNH-doctors-perform-surgery-on-wrong-patient/1056-4325292-iyudmvz/index.html. BBC News; Kenya Doctors Perform Brain Surgery on Wrong Patient, 2018; https://www.bbc.com/news/world-africa-43255648. Hindustan Times, Kenyan Doctor Performs Brain Surgery on Wrong Patient, 2018; https://www.hindustantimes.com/world-news/kenyan-doctor-performs-brain-surgery-on-wrong-patient/story-8DWml5AAoAjKXXD2AsikDK.html. Straits Times, Kenyan Doctor Performs Brain Surgery on Wrong Patient, 2018; https://www.straitstimes.com/world/africa/kenyan-doctor-performs-brain-surgery-on-wrong-patient-0. 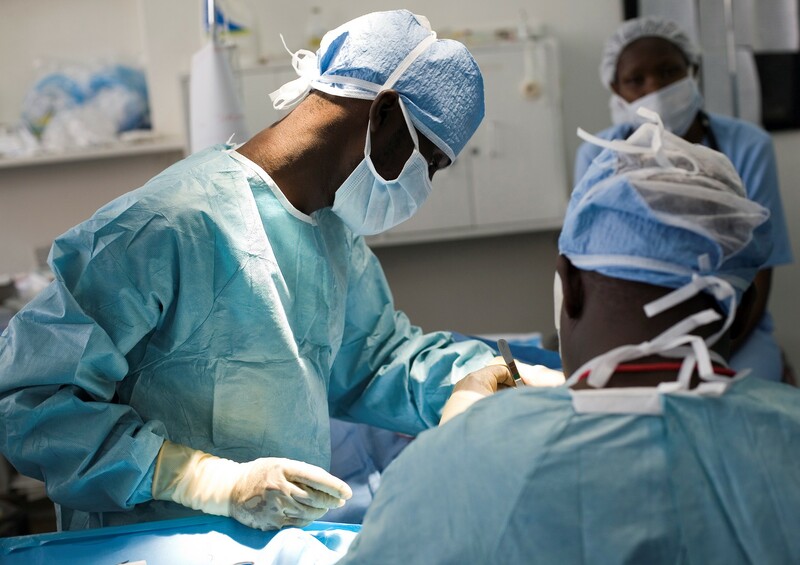 The Times of Israel, Kenyan Doctor Performs Brain Surgery on Wrong Patient, 2018; https://www.timesofisrael.com/kenyan-doctor-performs-brain-surgery-on-wrong-patient/. New York Post, Doctors in Kenya Perform Brain Surgery on Wrong Patient, 2018; https://nypost.com/2018/03/02/doctors-in-kenya-perform-brain-surgery-on-wrong-patient/. CNN; Surgeon Accused of Removing Kidney from Wrong Patient, 2016; https://www.cnn.com/2016/08/10/health/kidney-removed-from-wrong-patient/index.html. The New York Times; When Surgeons Cut the Wrong Body Part, 2007; https://well.blogs.nytimes.com/2007/11/28/when-surgeons-cut-the-wrong-body-part/. NBC News; Third Wrong-Sided Brain Surgery at Rhode Island Hospital, 2007; http://www.nbcnews.com/id/21981965/ns/health-health_care/t/third-wrong-sided-brain-surgery-ri-hospital/#.W2IAAtJKjIU. ABC Action News; Florida Keeps Public in Dark about Serious Medical Mistakes, 2016; https://www.abcactionnews.com/news/local-news/i-team-investigates/wrong-way-surgeries-the-sunshine-state-keeps-public-in-the-dark-about-serious-medical-mistakes. Cobb, Tyson K., MD, Wong-site Surgery: Where We Are and What is the Next Step, 2012; Hand magazine, a Publication of the American Association of Hand Surgery; https://www.ncbi.nlm.nih.gov/pmc/articles/PMC3351519/. World Health Organization, 2014; http://www.who.int/countries/ken/en/. Centers for Medicare and Medicaid Services, National Health Expenditure Data; https://www.cms.gov/Research-Statistics-Data-and-Systems/Statistics-Trends-and-Reports/NationalHealthExpendData/NationalHealthAccountsHistorical.html. World Health Organization; Density of Physicians (Total Number per 1000 Population, 2014; http://www.who.int/gho/health_workforce/physicians_density/en/. Mark Tozzio, has more than 35 years of executive level healthcare systems business development, management and consulting experience. He received his Fellowship from the American College of Healthcare Executives (Chicago, Ill.) in 2002 – a distinction held by only 10,000 health executives worldwide. Tozzio is founder and president of Hospital and Physician Practice Development Inc. (HPPD), an international healthcare consulting firm specializing in health systems development, Integrated Provider Networks, Collaborative Care Initiatives and Accountable Care Organizations for hospitals and health systems in the United States and Caribbean Islands. 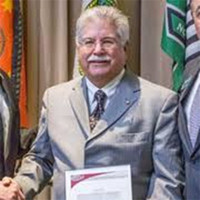 He created a series of healthcare courses for U.S. and international health professionals in the caring fields, which is offered by Northeastern State University in his home state of Oklahoma. Tozzio has consulted for governmental organizations in the Cayman Islands, Aruba, Brazil and African nations. He is a graduate of the University of Oklahoma, with distinction, and holds a Masters in Inter-professional Health and Human Services Administration (M-IHHS). For more information, please contact Tozzio at tozzio@nsuok.edu.